Astronomers at the European Space Observatory (ESO) have photographed a distant 'twin' of the Milky Way galaxy. 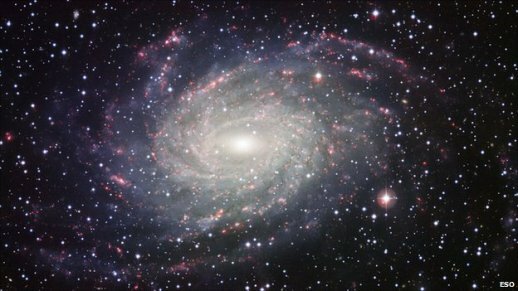 The galaxy, imaginatively named NGC 6744, is more than 174 million trillion miles away. Astonishingly, the light from our distant twin has taken 30 million years to reach us. NGC 6744, a spiral galaxy like our own Milky Way, resides in the southern hemisphere constellation of Pavo (The Peacock). However, our 'twin' is almost twice as big as the Milky Way at nearly 200,000 light years across. For more information on NGC 6744 visit the ESO website.